You asked for it – we deliver! Yudale, Benny und Momo would love it – our Eis am Stiel Summer Special am 21. Juli ab 22 Uhr im Kibbutz Club-U. Hot Balagan am Dancefloor wie am Strand von Tel Aviv garantiert. 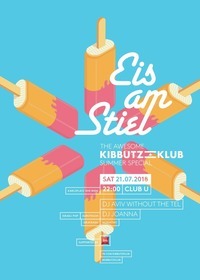 Eis am Stiel means: Hitzefrei ab Samstag, Gratis-Eislutschger solange der Vorrat reicht, dance the hora (or twerk) like nobody’s watching and summer madness at our own Yerushalaim-beach, Goldstar in the sun, Israeli vibes till dawn. Wow: Israeli DJs im Doppelpack! DJ Aviv (without the Tel) tauscht seinen Platz am Strand gegen das DJ-Pult in Wien. Und er kommt nicht alleine. Introducing DJ Joanna, the yemenite queen straight outta Tel Aviv/Berlin – so gay, so meschugge! You will see, honeys. Together they hit you with the finest Israeli Pop, Mizrachit & Oriental Buzz frisch aus den Clubs von Tel Aviv! And we don’t forget the Eurotrash-Boys-Girls: the dancefloor is on fire! Ice ice baby am Frishman Beach. Twinni schlecken am Donaukanal. Yerushalaim Beach full of Cornettos ;-) Lick our Eis am Stiel real’ good! Eis am Stiel FOR FREE solange der Vorrat reicht! Sticky tongues and summer flavours! SPECIAL: Israelische Biere GOLDSTAR und MACCABEE solange der Vorrat reicht!